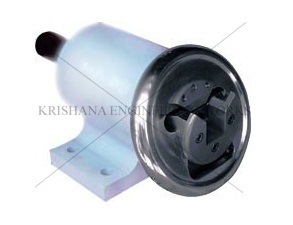 Tilt Type Safety Chuck Manufacturer, Krishna Engineering Works is a company engaged in Manufacturing, Exporting & Supplying of Safety from Ahmedabad, Gujarat, India.We are Also Manufacturer of Safety Chuck With Brake winner of 3 times National Award and 2 times International Award for Quality manufacturing. We also engaged in Manufacturing ,Exporting & Supplying Of Air Shafts like Mechanical Shaft, Quick Lock Shafts, Multi Tube Shafts and, Air Expandable Shaft; Air Chucks, Quick Lock and, Spare Parts. Also, all type of Air Shaft Manufacturer with high quality material. Safety chucks or Locking Assembly are square bar holding device. It can hold square bar size 1″, 1″1/4″ , 1″1/2″, 2″ or 3″. Safety chucks are also manufactured in mm sizes 25mm, 32mm, 38mm, 40mm, 45mm, 50mm, 75mm as per specific requirement of weight to be handled. Replaceable inserts are the main advance of sliding type safety chucks and it is having more square bar holding area than tilting type safety chucks. For fixing tension control brake safety chucks comes with extended shaft on one side. Square bar Size are decided consider the load & application.